B026-1017. Medieval Fortress Chess Board. This wooden chess board has legs and sides reminicent of a medieval fortress. It goes magnificently with all hand painted historical chess pieces. The board is 17.5x17.5 inches. The squares are 1 5/8 inches. The base is 3 1/2 inches tall. BO208-3534OGY. Grey Ivory & Briar Wood Glossy Chess Board With Border Inlay. This grey ivory and briar wood Chess board almost looks like it's made of marble. It has a luxurious glossy finish with a beautiful frame inlay that adds to its beauty. All size options for this chess board are shown below. This very vibrantly different ivory and briar glossy chess board features gracefully beleved edges and a beautiful inlay border design with a red stripe that gives this board a distinct and refreshing twist on the classic appeal. All size options for this chess board are shown below. This brown and natural chessboard is made out of the fine Spain sycamore and walnut wood. It has a luxurious semi glossy finish highlighted by brass corners that adds touch uniqueness to the piece. 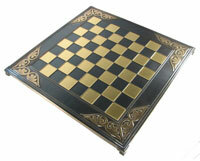 This elegant board goes very well with almost all your chess pieces, especially with brass and richly toned chessmen. A very elegant and classic design for an unbelievable price! All size options for this set are shown below. BO206-513. Grey Ivory Burl Chess Board. This Grey Ivory and burl wooden chess board is an unexpected delight that almost looks like it’s made out of marble. It has a luxurious glossy finish and pairs nicely with almost any chess piece. The board measures 15” x 15” with 1.5” squares. Chess enthusiast will appreciate the unique and handsome craftsmanship used to create this chess board that features a deluxe golden metal chessboard, gold and brown truly unique made in Greece. The chessboard measures 18" x 18" with 1-3/4" squares. A wall mounted chess board that is perfect for your office or home. Play without the pressure of time, as you walk by the board mark it with the last move tag and wait until your opponent makes the next move. This is a casual game. This chessboard besides providing you with hours of fun will be a handsome decorative item that many will admire, and best of all is out of the closet and out of your way. The board is made from light maple wood and it measures 33" tall x 21" Wide including frame. Playing field 15.5 x 28". Squares are 1 3/4" x 3 1/4". This board comes with three decorative frame options. Please select the frame option of your choice when purchasing this item. This is a very unique chessboard that is vertically wall mounted with a decorative frame that will be a great addition to any room. This chessboard is made for a casual game, as you pass the chess board make a move and mark it with last move tag, that way the game goes on as days go by. You will definitely be hooked on this fascinating twist of the classical chess game. The board measures 33” tall x 21 “wide including frame. Squares are 1 ¾” x 3 ¼”. Playing field measures 15.5” x 28”. 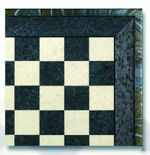 Made Italy this prestigious chessboard is crafted from high quality woods. The beautiful gold leaf tone contrasted with the mahogany dark wood tones adds a look distinction to this exquisite board. This wood board goes great with almost all chess pieces. The board measures 20” x 20” with 2” squares. Carefully selected cuts of the finest maple, walnut, mahogany & briarwood are combined to create this intriguing and collectible piece. A work of art for a very reasonable price! The border inlaid design, the beautiful brass hinges and the storage compartment with lock and key set are features that add a look of distinction to this wonderful masterpiece. The board measures 16 ¾”x 16 ¾” with 1 ¾” squares. This chess board has a beautiful wood grain of this chess board really stands out. It is inlaid with elm root wood with a unique method of construction. Hand Crafted and Hand polished in Italy, this board is an excellent exquisite choice for anyone to enjoy! The board measures 20” x 20” with 2” squares. Handmade and hand crafted in Italy, This chessboard is vibrantly unique. Carefully selected cuts of the finest woods inlaid Walnut, Maple, Mahogany & Briarwood are combined to create this beautiful and desirable item. The Chessboard features inlaid art work, brass piano hinges, and a storage compartment with lock and key set. The board measures 17 ¾”x 13 ¾” x 2 ¾” with 3/8”squares. This Italian made briarwood chessboard is magnificently detailed. It features a beautiful pallet of gold, silver with natural wood finishes, and an elegant beveled raised frame. The board measures 20 x 20with 2” squares. BO144-510.Deluxe Italian Alabaster Wood Chess Board. This Antique finished wood chessboard has a convenient storage compartment for all your game pieces. Hand made in Italy from genuine alabaster this chessboard is a fine choice for all the chess connoisseurs. The board measures 21” with 1 ¾” squares.